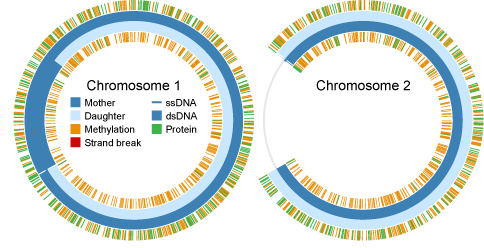 Chromosome copy number, superhelicity, integrity, and DNA binding status. Currently, WholeCellViz provides access to cached simulations of the Gram-positive bacterium Mycoplasma genitalium2. See the Advanced usage section below for information about how to install WholeCellViz locally to use the software to run and analyze your own simulations and/or other high-throughput biological data, as well as how to add additional visualizations. 14 structured visualizations encompassing a wide spectrum of cell physiology. These visualizations each provide tooltips and mouse clicks to enable users to obtain further information. A time series plot tool to further explore model predictions. A layout editor which enables users to configure a grid of structured visualizations and time series plots, enabling users to simultaneously compare multiple model predictions side-by-side. A layout history. Simply use your browser's backward/forward buttons to undo/redo layout changes. A single animation timeline with play, pause, seek, speed, and repeat controls. WholeCellViz is freely available open-source and can be easily expanded for use with new whole-cell simulations and other high-throughput data. See the Advanced usage section below for information about how to install WholeCellViz locally to use the software to run and analyze your own simulations and/or other high-throughput biological data, as well as how to add additional visualizations. The version of WholeCellViz at wholecellviz.org is currently limited to cached simulations of the Gram-positive bacterium M. genitalium. Please install WholeCellViz locally on your own machine to use WholeCellViz to analyze other whole-cell simulation data and/or to add additional structured visualizations to WholeCellViz. See the Advanced usage section below for more information. Use the play, pause, seek, speed, and repeat controls at the bottom to control the animation timeline. See the tutorial ("Help" » "Tutorial" from the top-left menu) inside the software for additional help getting started. We recommend using Chrome. WholeCellViz was developed and extensively tested using Chrome on Windows 7. See the implementation section below for further information on browser compatibility. WholeCellViz provides users 14 structured visualizations (below) to visually analyze whole-cell model simulations. 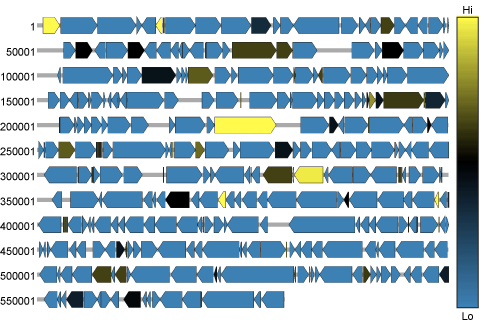 This visualization displays the polymerization (blue), protein DNA binding (green), methylation (orange), and strand break (red) status of the M. genitalium chromosomes. 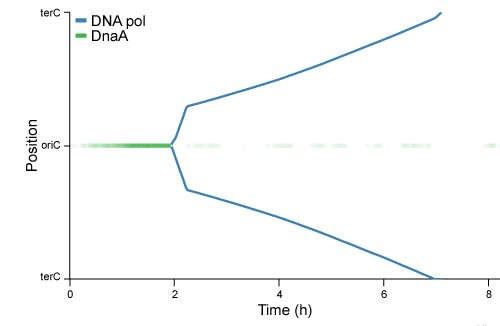 Mother DNA is colored dark blue. Daughter DNA is colored light blue. 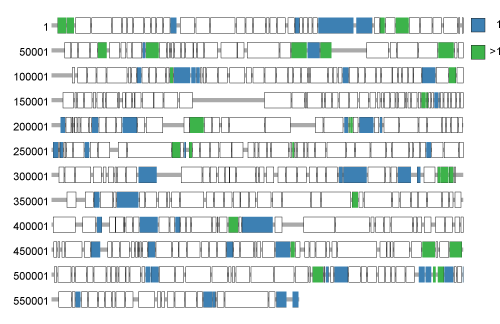 This visualization displays the mature copy number of each RNA transcript over the cell cycle. Each colored rectangle represents an individual transcription unit. Mouse over each transcription unit to see its name and a brief description. Click each transcription unit to obtain a detailed description at WholeCellKB. The copy number of each transcript has been normalized to its maximal expression over the cell cycle. High expression is colored yellow. Low expression is colored blue. This visualization depicts the fluxes of several metabolic reactions (green indicates high flux, red indicates low flux) and the concentrations of several metabolites (node size). 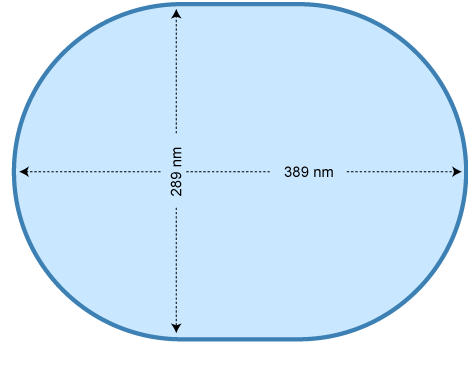 This animation displays the predicted shape of M. genitalium over its life cycle. FtsZ proteins are believed to catalyze cell division by cyclically forming and contracting rings at the cell septum during cell division. 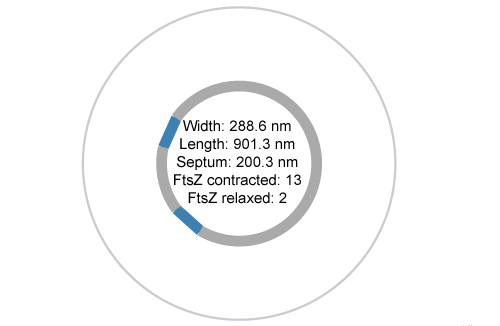 This visualization displays the state of the FtsZ contractile rings during cytokinesis. Each thin line represents one FtsZ filament. Each thick line represents two parallel FtsZ filaments. Blue lines represent unbent filaments. Gray lines represent bent filaments. 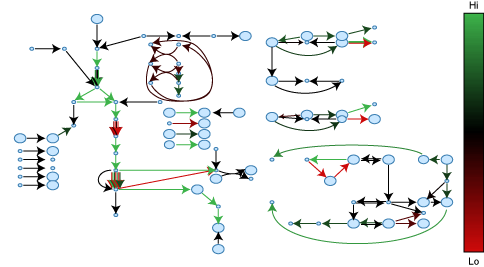 This visualization is a space-time plot of the replication initiation (green) and replication machinery (blue). This visualization displays the nascent copy number of each protein monomer over the cell cycle. Each colored rectangle represents an individual protein monomer. Mouse over each protein monomer to see its name and a brief description. Click each protein monomer to obtain a detailed description at WholeCellKB. The copy number of each protein has been normalized to its maximal expression over the cell cycle. High expression is colored yellow. Low expression is colored blue. 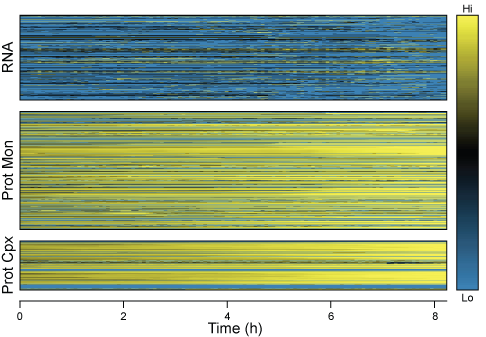 This visualization displays the nascent copy number of each RNA transcript over the cell cycle. 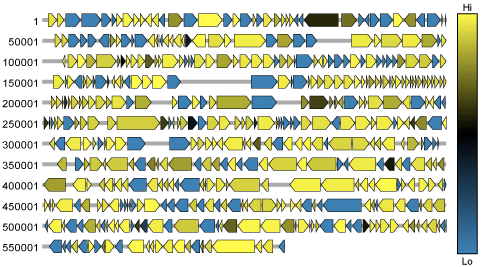 Each colored rectangle represents an individual transcription unit. Mouse over each transcription unit to see its name and a brief description. Click each transcription unit to obtain a detailed description at WholeCellKB. This visualization displays the mature copy number of each protein monomer over the cell cycle. Each colored rectangle represents an individual protein monomer. Mouse over each protein monomer to see its name and a brief description. Click each protein monomer to obtain a detailed description at WholeCellKB. 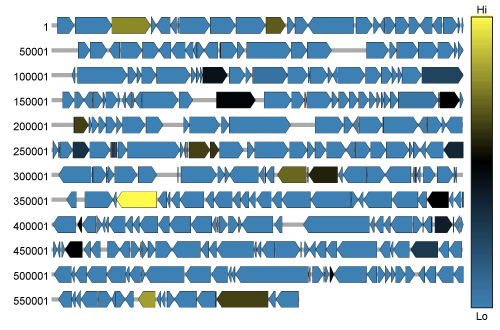 This visualization depicts the length of the longest polypeptide of each protein-coding gene. Protein-coding genes with one active ribosome are colored blue. Genes with multiple active ribosomes are colored green. 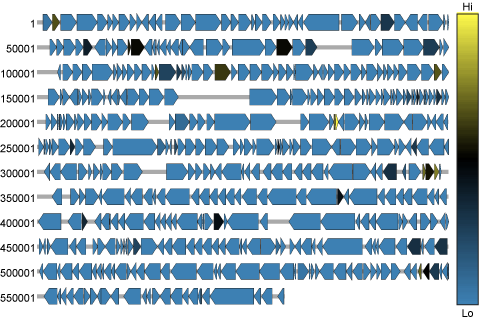 This visualization displays the expression of every RNA and protein gene product. High expression is colored yellow; low expression is colored blue. 29 DnaA molecules are believed to segregate the chromosome strands and thereby initiate DNA replication by cooperatively binding to five (R1-5) high affinity sites near the oriC. 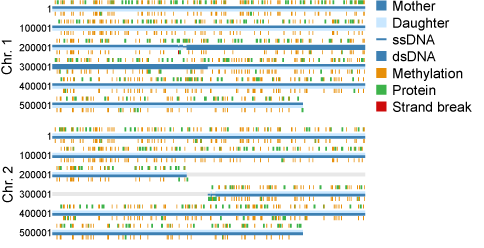 This visualization represents the DnaA occupancy of the R1-5 sites. The only requirement for running WholeCellViz is a modern web browser (see recommended browsers). Otherwise, no installation is required. To start WholeCellViz click the "Start" button at the top-left of this page. Clicking the start button will open WholeCellViz already configured with grid of six structured visualizations. The easiest way to start using WholeCellViz is to view the seven example visualization views (grids of related structured visualizations). Click the buttons at the top-right of the page to open each example view. Open the configuration editor by selecting "Edit" » "Panels" from the top-left menu. Select the desired grid size (number of rows and columns of panels, each of which can contain one structured visualization or one set of time series plots). Use the "Configure panel" select box to choose the panel you wish to configure. Use the "Simulation" select box to choose a simulation to plot. Use the "Series" text box to search the model predictions (e.g. type "ATP"). Search results will displayed in the select box immediately below. Second, optionally use the "Series type" select box to search just a subset of the model predictions (e.g. only metabolites). Next, highlight the model prediction(s) you wish to plot in the results select box. Click the icon to visualize the highlighted model prediction(s) in the selected panel. Finally, highlight rows in the table at the right-hand-side and click the icon to remove model predictions from the panel. WholeCellViz uses your browser's location history to track its configuration history. To undo a configuration change simply press your browser's back button. To redo a configuration change simply press your browser's forward button. Click the icons at the top-right of the visualization panels to expand panels to the occupy the entire screen. Click the icon at the top-right of each visualization panel to open a help window containing a textual description of the panel's content. Click the icon at the bottom-right of the screen to toggle on/off visualization labels (e.g. metabolite, gene, protein, reaction names). To turn on/off user interaction (tooltips and mouse clicks) with the structured visualizations: (1) open the configuration editor by selecting "Edit" » "User interaction" from the top-left menu and (2) toggle the select boxes. Click the controls in the bottom menu to play, pause, seek, speed up/down, and repeat animations. Click the button to play animations. Click the button to pause animations. Click the button to open a slider to select the animation speed. Drag the progress bar thumb to seek the animation to a desired time point. Click the icon to toggle animation looping on/off. To import data stored on another server other than WholeCellViz.org, select "Edit" » "Data source" from the top-left menu and then enter the data source URL. The URL must point to another server running the WholeCellViz server software. See the installation instructions for more information. To export the graphics currently plotted in WholeCellViz in SVG format select "Download" » "Graphics (SVG)" from the top-left menu. SVG is common vector graphics format which can be edited by popular vector graphics editors such as Illustrator and Inkscape. To export the data currently plotted in WholeCellViz in JSON format select "Download" » "Data (JSON)" from the top-left menu. JSON is a very popular data interchange format supported by most modern programming languages. By default WholeCellViz is configured to read cached whole-cell simulation data stored at wholecellsimdb.org. To change the data source URL: (1) from the top menu click "Edit" » "Data source" and (2) enter the desired data source URL. Note: this URL must point to a location where all of the server-side WholeCellViz software is installed. See Installing WholeCellViz locally section for further information. To add a new structured visualization to WholeCellViz: (1) install WholeCellViz locally on your own machine, (2) add a new subclass of the Visualization2D or Visualization3D classes to wholecellviz/js/WholeCellViz-visualizations.js, and (3) add a new entry to the WholeCellViz metadata MySQL database corresponding to the new visualization. The easiest way to run the WholeCellViz software locally is to download the Whole-cell virtual machine posted at SimTK. Installation and usage instructions are also posted at SimTK. The virtual machine is a virtual Mint Linux machine for use with the free VirtualBox software. The virtual machine includes WholeCellViz as well as the simulation software and WholeCellKB. The virtual machine can be used to run new whole-cell simulations, analyze new simulations using WholeCellViz, and add new structured visualizations to WholeCelLViz. To install WholeCellViz on your own machine: (1) download the WholeCellViz source code from SimTK, and (2) follow the installation instructions posted in the Developer's Guide at SimTK. 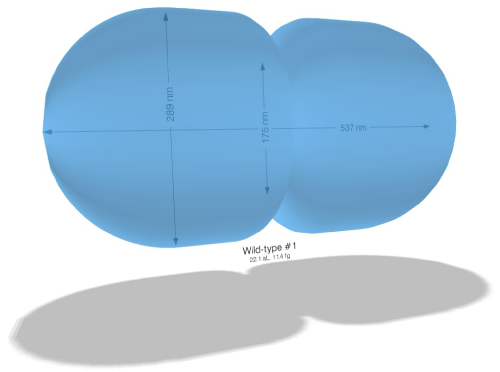 See wholecell.org for further information about installing and running the whole-cell simulation software. The WholeCellViz source code and simulated data are freely available under the MIT license at SimTK. WholeCellViz was tested on several browsers including Chrome (v26.0.1410.64, Windows), Firefox (v20.0.1, Windows), Internet Explorer (10.0.9200.16540, Windows), and Opera (12.15, Windows). All browsers work well with two exceptions (1) Opera displays arcs differently from the other browsers, causing Opera to display the 2D cell shape animation incorrectly and (2) only Chrome supports the three.js library, and therefore only Chrome can display the 3D cell shape animation. Please contact us at wholecell@lists.stanford.edu with any questions and/or comments about WholeCellViz.